Thank you for donating to the Brooklyn Food Pantry! 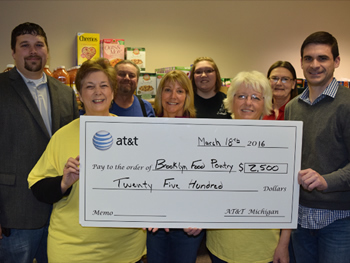 In March 18, 2016, the Brooklyn Food Pantry received a donation of $2,500.00 from AT&T. We wish to thank AT & T for their continued support. With this donation we will purchase food to serve the people in our communities. Pictured with representatives from AT &T are a few of our outstanding volunteers. 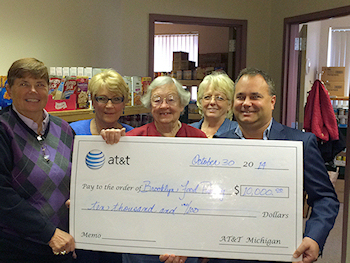 On October 30, 2014, the Brooklyn Food Pantry received a grant of $10,000.00 from AT&T. This donation will be used for some office equipment and to purchase extra food for our shelves. We wish to thank AT&T, the Michigan President of AT&T, Jim Murray, and AT&T External Affairs Manager Andrew Solon for making this grant possible. Pictured are Brooklyn Food Pantry Board members Estella Roberts, Kathy Hartland, Joyce Kipker, Marcia Kortas and Jim Murray, President of AT&T Michigan. 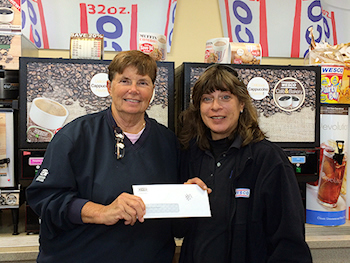 The Brooklyn Food Pantry received at donation of $1,220.00 from the WESCO Store in Brooklyn, Michigan on October 23, 2014. The Brooklyn store collected money during July and August which was matched by the WESCO Corporation. Pictured is Amy Coffelt, Wesco Location Manager, and Estella Roberts from the Brooklyn Food Pantry Board.